Exit I-5 at Cottage Grove. Travel south on Highway 99 to Harrison Avenue. Turn west on Harrison to Old River Road. Turn south on Old River Road. Chambers RR is off of Old River Road just south of Harrison. The Chambers Bridge is the last covered railroad bridge in Oregon. It was built by the Oregon, Pacific and Eastern Railroad for a logging spur which brought logs to the Frank Chambers Mill in Cottage Grove. The actual use for the bridge was short, as the sawmill burned in 1943 and rail traffic no longer crossed the bridge. Although the bridge trusses are now exposed, at one time the siding completely enclosed the structure to afford maximum protection for the timbers. In the typical construction for railroad spans, truss members of herculean proportions were necessary to support the moving weight of rail payloads. The hand hewn trusses in the Chambers Bridge, like others, were preferred over millsawed timbers because the wood fibers crushed by saw teeth allowed moisture to more readily enter the axe-formed surfaces. The western approach to the bridge has been removed to make way for the easement of South River Road. Abandoned for years, the bridge has been a frequent target of arsonists, as the charred timbers attest. Fortunately, the bridge has not succumbed to fire. Built to accommodate steam engines pulling logging trains, the sides of the Chambers Bridge reach much higher than highway covered spans and give the bridge an appearance of being much longer than its actual length. 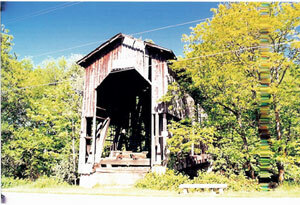 The bridge was inspected under the 1993-95 Covered Bridge Program. The bottom chords show extensive decay, and in some places three of the four members are rotted. In several places all three members of the floor beams are rotted. Corbels are decayed and crushed, which makes the house lean as much as 12 inches to the upstream side.